Drums Alive, a unique music-based exercise program, has come to Pennswood Village! The program has gained popularity around the world because it’s not only fun and energetic, but also has a long list of potential health benefits for both the body and mind. During the program, each participant has a stability ball, a riser to hold the ball and a set of drumsticks. The instructor teaches a few moves, then the music starts playing. For the next 45 minutes, participants drum along together, dancing and enjoying the collective sounds! Your first day at a retirement community is exciting, nerve-wracking and full of new things. Maybe you’re not sure where to grab a bite to eat, how to get to the pool, or how to get involved in an activity. There are so many new places to see and people to meet, and you may not be sure of just where to start. That’s where the Pennswood Village Newcomers Club comes in—a club dedicated to helping new Pennswood residents become acclimated with the many opportunities available. The Club, which first started in November of 2016, helps new residents get oriented to the Pennswood community. The Club meets on the first and third Tuesday of every month, with a mix of new, newer, and “veteran” residents attending. Winter didn’t stop Pennswood residents from celebrating the color and life found in its gardens. 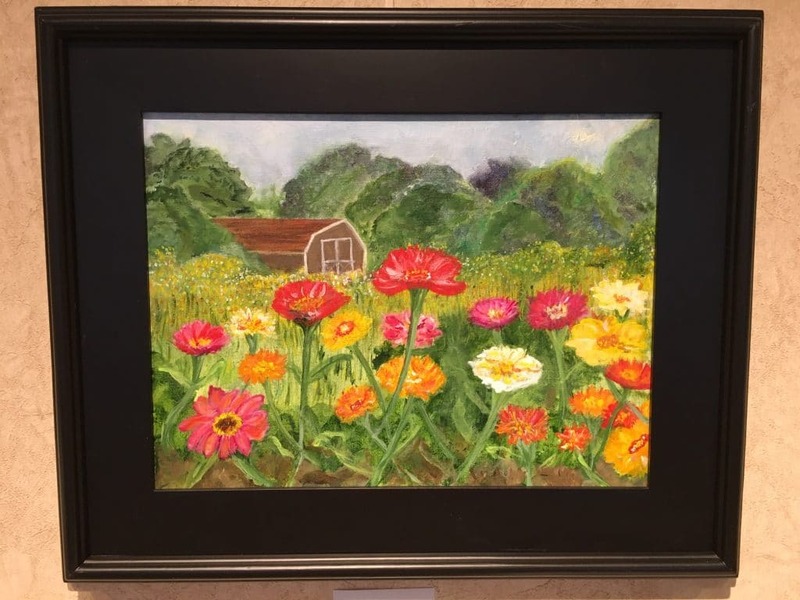 Last month, the art show, “Inspired by the Garden,” opened in the Passmore Gallery, featuring beautiful art centered around a garden theme. 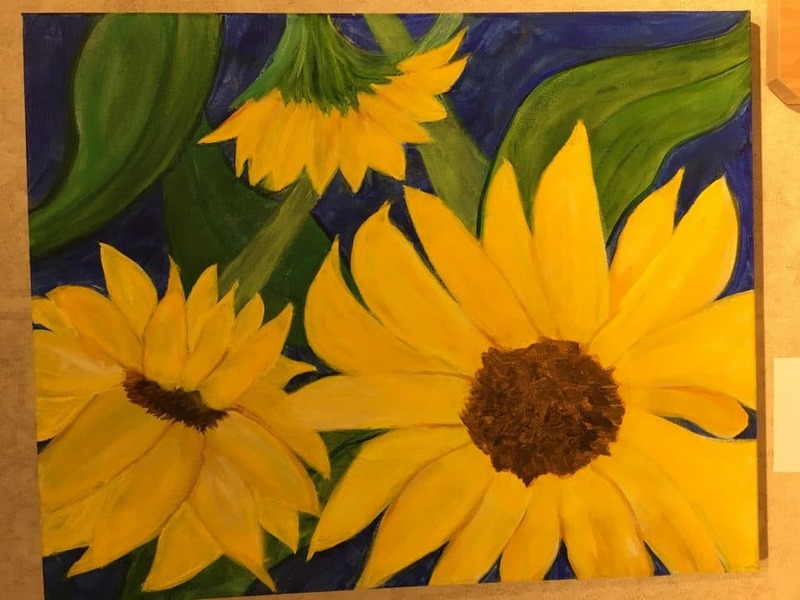 The show featured a range of colorful art curated by Pennswood residents, including paintings, photographs, collages, pottery, figurines and jewelry—all inspired by the garden. Among these curators were Flossie Fullerton, Jan Neitzel, Jane Crumlish, Daisy Grubbs, Lucy Hastings, and Lee Cavanaugh. Gardens are a big part of life at Pennswood, with residents growing vegetables and flowers in their personal plots in the community garden and on their homes’ patios and balconies. Residents also have the chance to move their potted plants into the Pennswood greenhouse during the colder winter months. 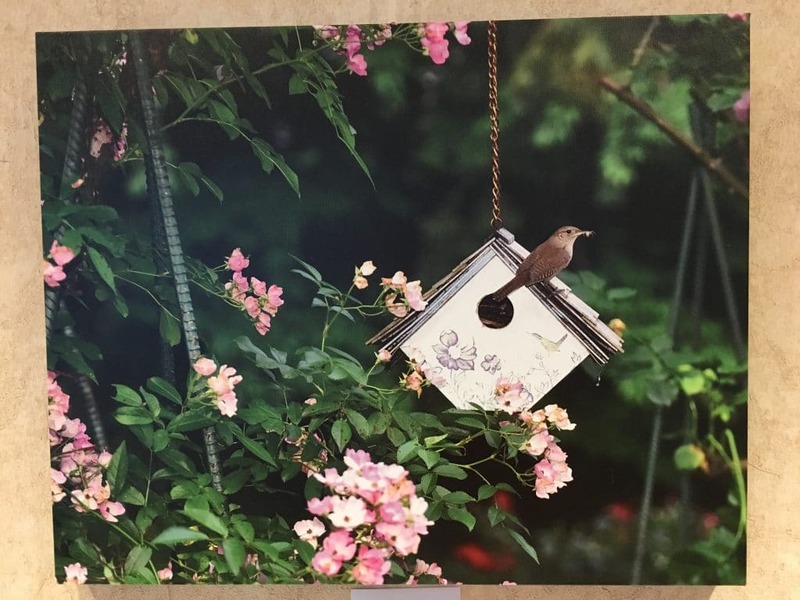 It’s because of this love for gardening at Pennswood that the idea for this art show evolved. Like many Pennswood residents, Sue has a great love for gardening that is shared with her husband, Jack, who heads up the Community Garden Committee, a group of people who care for the community garden. The couple became interested in the garden when they started growing plants in their own plot, and their interest grew from there. With this exhibition, the Passmore Gallery Committee spreaded the goodness of the garden in a different way. 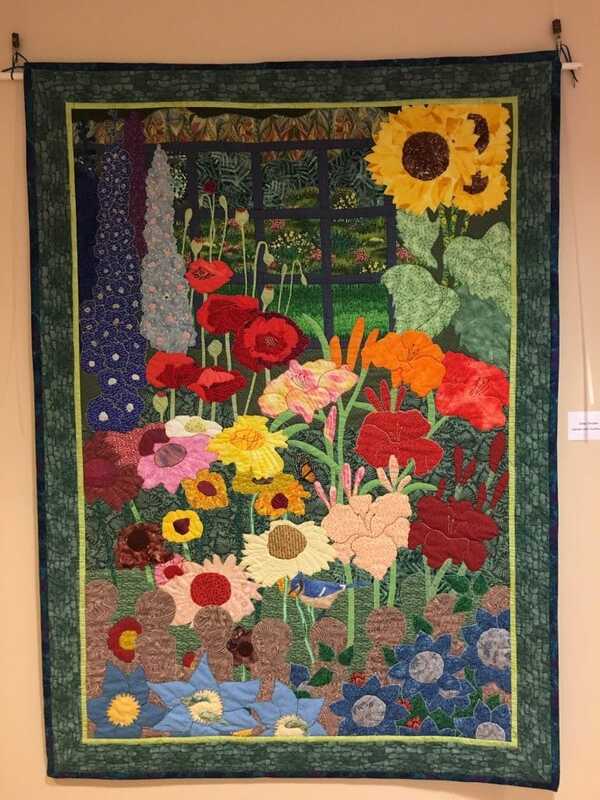 The reception for the colorful “Inspired by the Garden” show was held on a Sunday afternoon in January for friends, family and the community. “The receptions are a chance for the community to gather to chat about the art and enjoy refreshments,” said Sue. Sue’s contribution to the show included a set of collaged greeting cards that were designed and created by her daughter who gave them to her as a gift. Her daughter crafted the cards with a garden theme. Resident art shows aren’t the only way for art lovers to get involved in art in the Pennswood community. The community offers art classes often, and there’s always an occasion to display artwork. 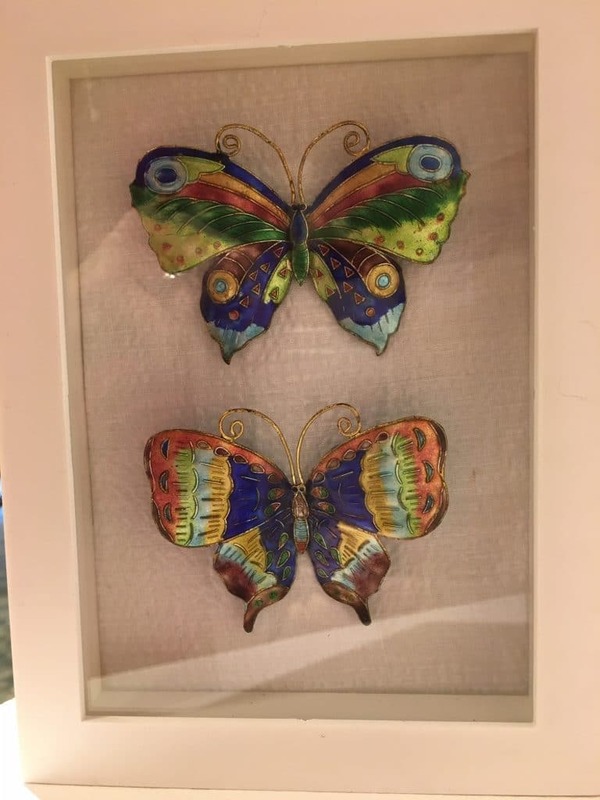 Residents can also hang their own art in the residence halls near their doors, which gives them an opportunity to display pieces from their personal collection throughout the year. A special display system for hanging the art makes it easy to change out the pieces. Residents can simply call the maintenance team to change out the art whenever they choose. 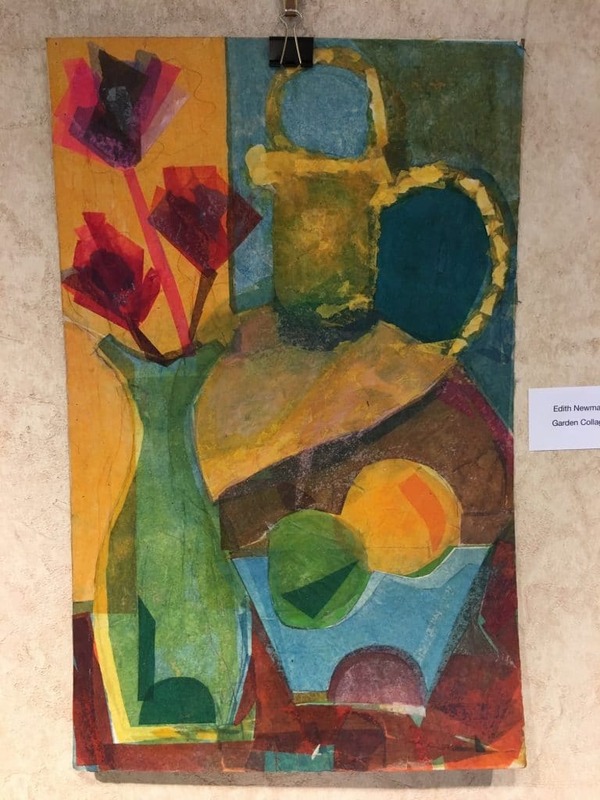 Residents can also join the Pennswood Art Gallery Committee, which operates the contemporary gallery dedicated to guest artists in the main lobby. This group reaches out to artists in the area and invites them to display their work at Pennswood. Artists recently shown include Demetra Tassiou, Bruce Garrity, Eva Mantell and Matthew Colaizzo. Pennswood is also home to a gallery dedicated to resident art and features both group and solo shows. 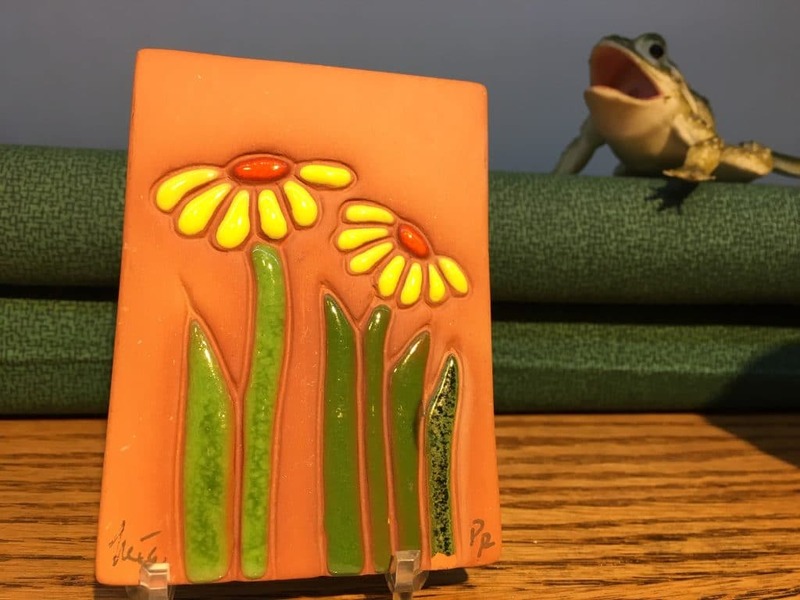 The “Inspired by the Garden” art show was displayed until March 28, 2019, when the art was returned to the curators and creators. Soon after, the next exhibition began for the community to enjoy. For more information on the artful lifestyle that’s possible at Pennswood, give us a call today at 215-504-1118, or visit us online to request a free information kit. Film Festival Celebrates the Life and Work of Dr. Martin Luther King, Jr. The residents at Pennswood Village recently held a film festival that spanned several nights to celebrate the life and work of Dr. Martin Luther King, Jr. Timed to be viewed around his birthday, the film festival showcased three films that explored King’s life or other themes in the fight for racial equality. The films acted as a catalyst, sparking conversations among residents about race issues and potential ways to become allies in the struggle to live up to our nation’s ideals of justice for all. Pennswood Village residents are proud advocates of racial equality, with several different committees dedicated to peace, equality, and social justice. 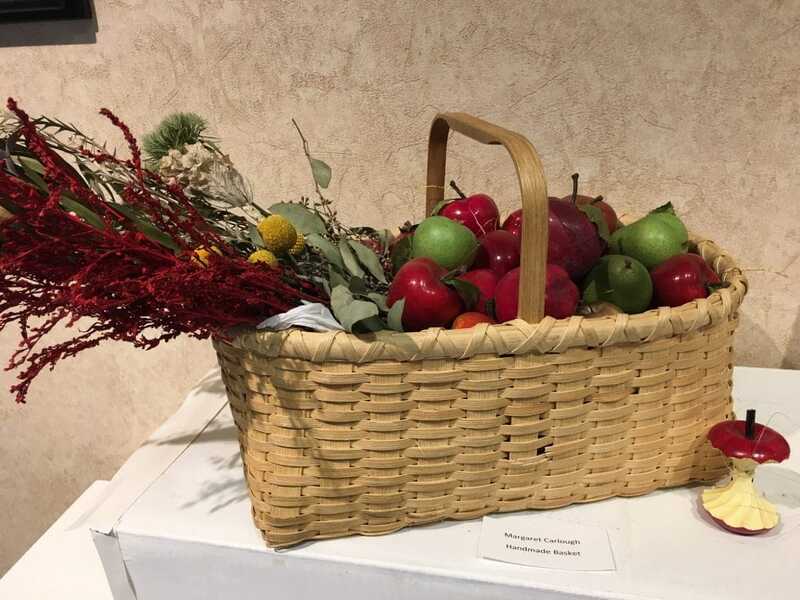 The event was organized by residents on the Peace and Social Justice Committee and the Quakerism Committee, two groups that work for peace and equality in all capacities. “He’s such a role model for the struggle for equality,” says Lynne Waymon, Chairperson for the Peace and Social Justice Committee, regarding Dr. King. “He had much to teach us about non-violence, the civil rights movement and how we can advocate for the civil rights of all. The small group discussions in the Café after each film are such a good way to get to know fellow residents and talk about how we can turn concern into action and live up to the values we espouse. The first movie, “Notes from the Field,” was shown on January 16, a few days before Dr. King’s birthday. 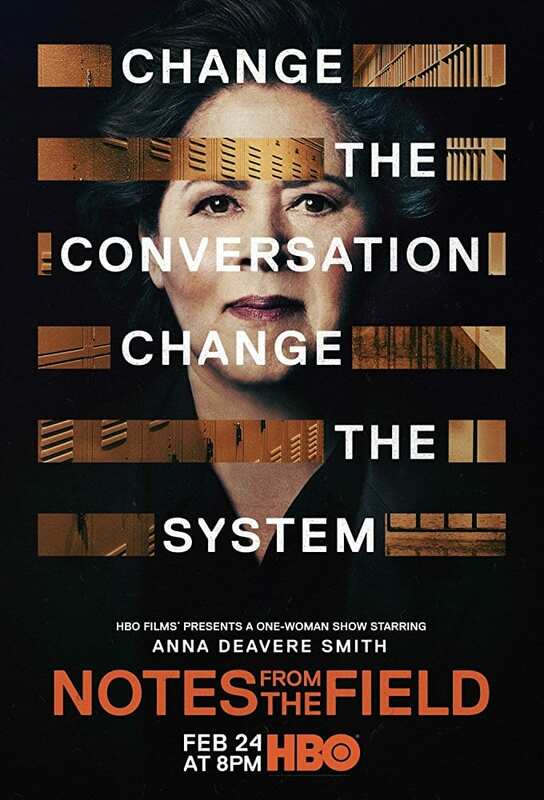 It is a startling film that introduces 18 different characters – all played by Anna Deavere Smith. Each character is a person who has in some way been touched by America’s school-to-prison pipeline, which pushes underprivileged, minority youth out of the classroom and into incarceration (source), such as a guard, an inmate, a family member, an educator and a politician, among others. The film was originally produced as a stage performance, and then it was translated into film to reach a wider audience. Released just last year, the film offers a very relevant perspective on mass incarceration. Following the showing, residents who watched the film gathered in the café to share their reactions and reflections with one another. 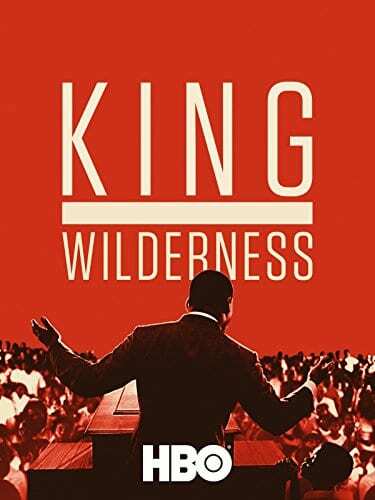 On January 21, Martin Luther King, Jr. Day, residents gathered to watch the second of the three films, “King in the Wilderness.” This film, also released just last year, focused on the last 18 months of Dr. King’s life. It features never-before-seen footage of King and people who were close to him throughout his life. The film is a historical presentation of how he refused to back away from civil rights challenges, despite the pressure from FBI director J. Edgar Hoover and President Lyndon B. Johnson. Instead, Dr. King focused on opposition efforts of the Vietnam War and economic inequality. Following this film, residents also gathered to hold a discussion about their personal takeaways. The final film, “The Passion of Dr. Martin Luther King, Jr.: How the King assassination continues to shape American democracy,” was shown on January 23. 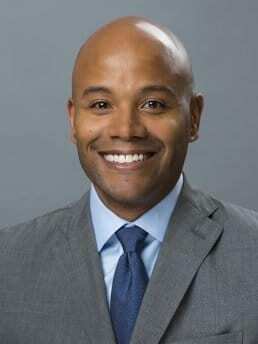 The film is a lecture by Dr. Peniel E. Joseph, a professor at The University of Texas at Austin, and award-winning author and scholar. As the name suggests, Joseph explores how King’s assassination still plays a part in shaping American politics and how it affects racial inequality today. Joseph’s work focuses on the Black Power Movement, as well as the Civil Rights Movement, and he has written several books on the subject. This film festival is just one of many examples of how Pennswood residents celebrate diversity and fight for social justice. To learn more about life at Pennswood Village, give us a call at 215-504-1118, or visit us online here to request your free information kit! When David Swain and his wife, Caroline, moved to Pennswood Village about 10 years ago, they were excited to begin their active community lifestyle. They explored many of the resident organizations and events, but found none that revolved around one of their favorite passions: traveling. That’s when the two decided to start a group, now known as the Sharing Travel Adventures group, where residents can share their travel adventures with one another. The holidays at Pennswood are full of activities and events celebrating the season! Families and friends gather to share their traditions, and because Pennswood residents come from a multitude of backgrounds and cultures, there is a variety of activities and events in which to participate. Despite having a low profile, Pennswood’s latest ‘resident’ has been getting around quite a bit since arriving recently, and has even attracted a small but growing fan club. That ‘resident’ is a three-wheeled recumbent tricycle.